I, Zeb the Duck, like tea. My mom also likes tea. 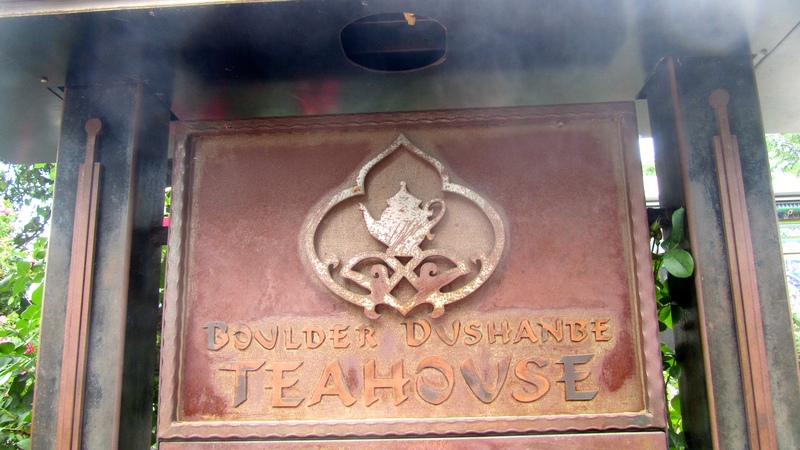 We love the Boulder Dushanbe Teahouse in Boulder, Colorado. 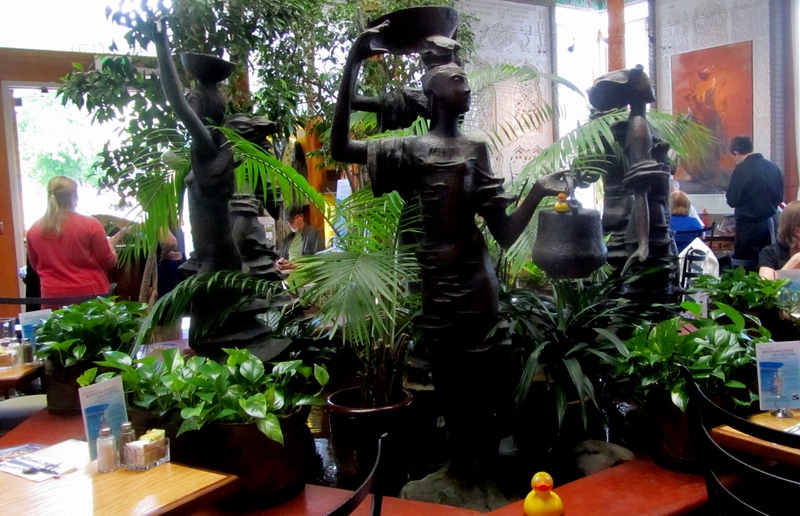 We met some human friends there for lunch and want you to see this Teahouse. Boulder, Colorado is a sister city to Dushanbe, Tajikistan and Boulder received this magnificent gift. Our teahouse was built completely by hand from 1987-1990, by more than 40 artisans in several cities of Tajikistan. Let’s visit the Teahouse. 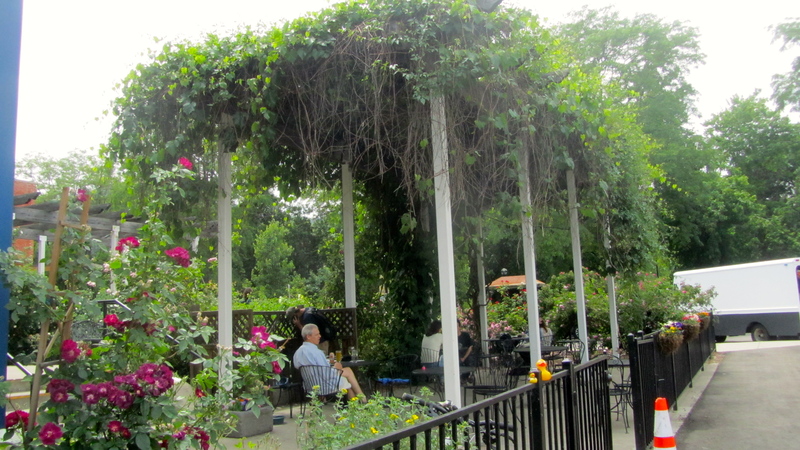 The Teahouse is on the Boulder Creek, in the heart of Boulder. The entrance faces a city park. Before we go inside, we want to enjoy the flowers. Flowers everywhere. Isn’t this ceramic panel colorful. Eight colorful ceramic panels, created by Victor Zabolotnikov, grace the building’s exterior and display patterns of a “Tree of Life”. 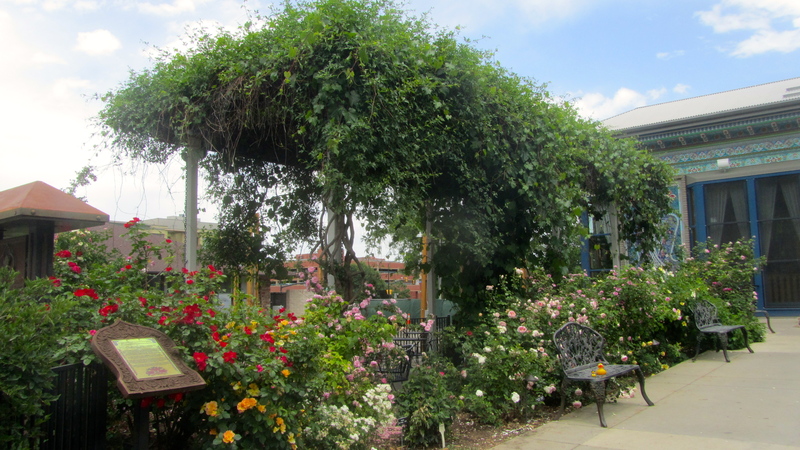 The beautifully landscaped outdoor dining area create an oasis within the city. I, Zeb the Duck, met some friends. My friend, Channel the Bear was there and a little duck friend, the Caped Crusader. Our moms let us have our own table, until it got busy at lunch time. Here is the Boulder Creek. It is nice to hear the water as we eat. So peaceful. We ate outside, but let’s enter the Teahouse now. Inside the Teahouse are eight large, intricately carved white plaster panels, designed and executed by Kodir Rakhimov. You can purchase green tea here. 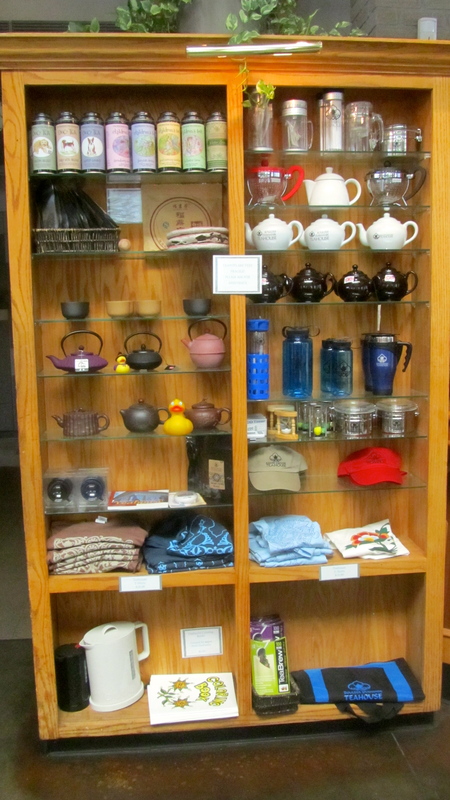 As we look around, we see more tea supplies. We love this place. The central pool features seven hammered copper sculptures by Ivan Milashevich, based on a 12th century poem, “The Seven Beauties”, in which a princess from each of seven different nations narrates a fable that expresses important cultural values. We love any restaurant or teahouse that has a pool inside. Don’t forget to look up. The ceiling of the Teahouse was carved and paint with intricate patterns traditional of Persian Art. 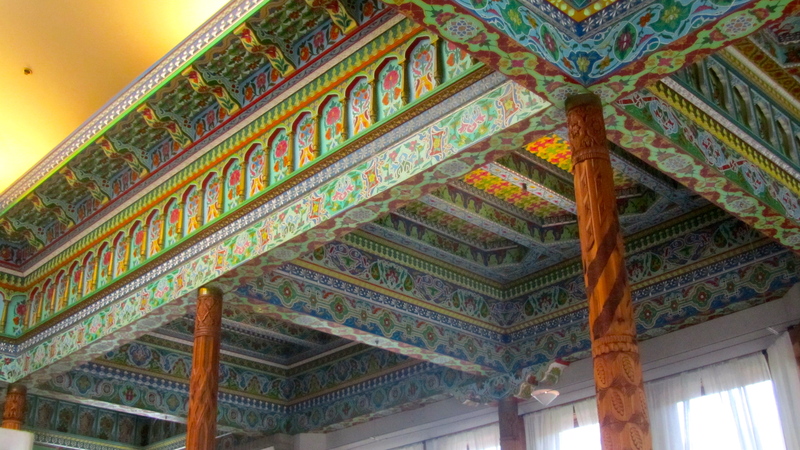 The teahouse ceiling was originally built, carved and painted in Tajikistan. Absolutely no power tools were used in the original construction. The work was crafted by hand exactly as it was centuries ago. Of the twelve cedar columns, no two columns are like. This Teahouse was completely built by hand in Tajikistan and then taken apart. Carefully packed in large crates, the pieces were shipped to Boulder, Colorado. Master woodcarvers, Manon Khaidarov and Mirpulat Mirakhmatov helped reassemble the Teahouse in Boulder and carved their names in the ceiling. 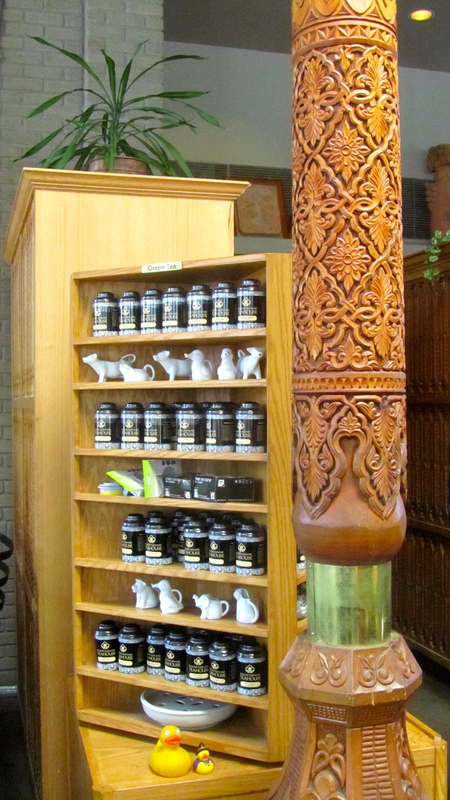 Several craftsmen from Tajikistan were in Boulder to reassemble and ensure that our Teahouse was as intended. As we left the Boulder Dushanbe Teahouse, we needed to have one more photo of this beautiful place. 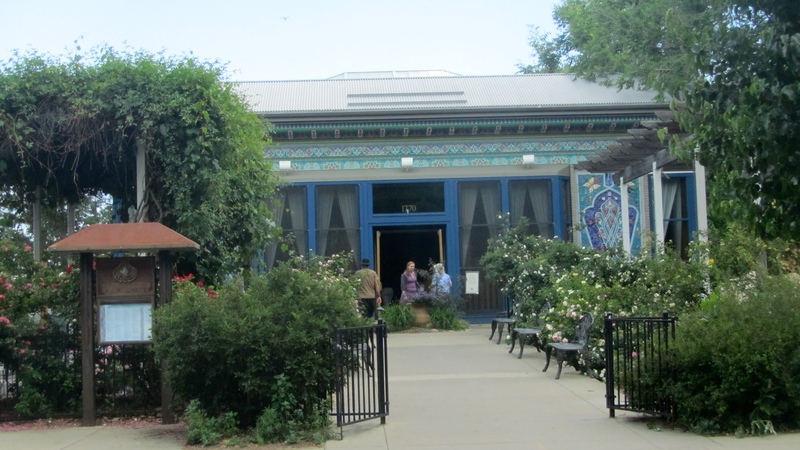 We hope you visit the Boulder Dushanbe Teahouse soon, at 1770 13th Street, Boulder, Colorado. Visit http://www.boulderteahouse.com for more information and additional photos. There is so much more. They have a farm to ensure fresh ingredients. They also serve afternoon tea. This place is wonderful. 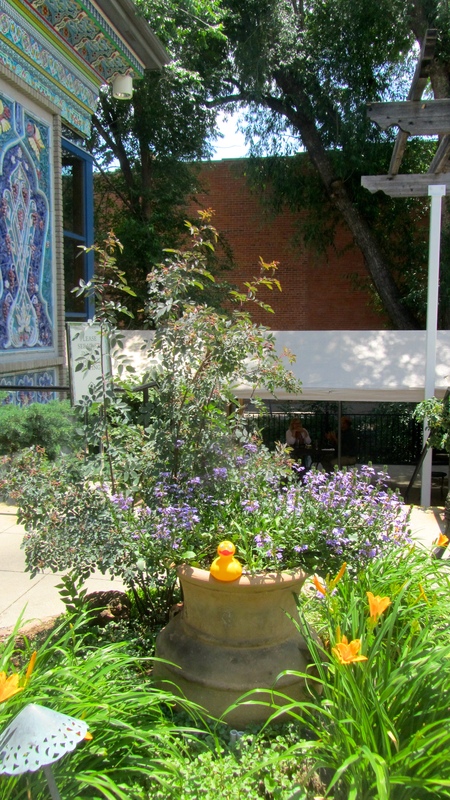 This entry was posted in Colorado, Uncategorized and tagged Boulder, Colorado, Colorado Traveling Ducks, Dushanbe Tajikistan, handcrafted teahouse, Teahouse. Bookmark the permalink. That was such a fun luncheon. It was a lot of fun. Such a beautiful building and a perfect setting. Thanks for reading and commenting. Yay I haven’t been there in ages. Thanks for the reminder! It is a great place. Hope you get there soon to enjoy beautiful spring weather, between our storms. Thanks for reading and commenting. Since we are both in Arvada some time later this year it might be fun to hook up. 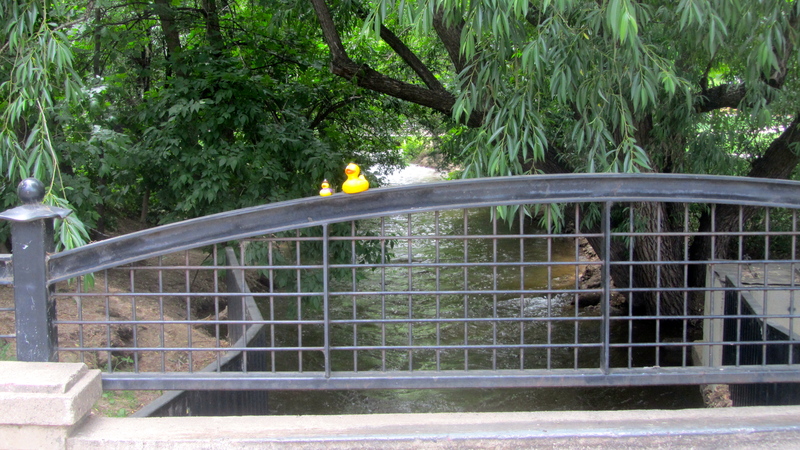 I would love to do a blog post on bumping into the Colorado Traveling Ducks! I am enjoying following you. That would be fun. 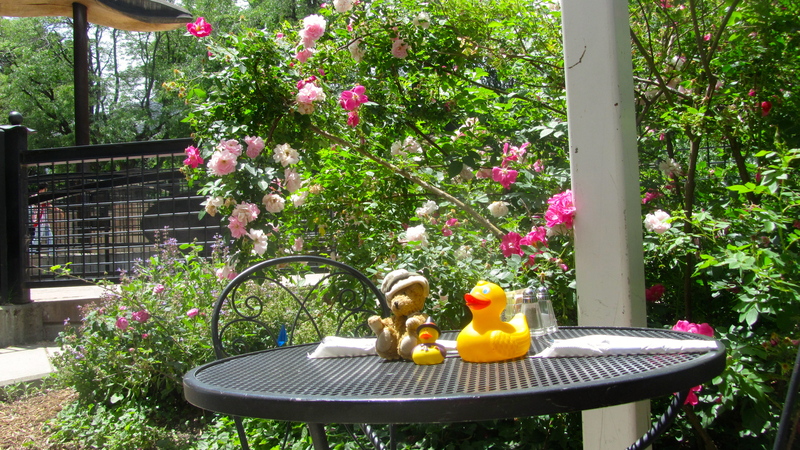 A new duck adventure and meeting a fellow Arvada blogger. We enjoy your blog also. How lucky are you to have such a pretty place close by. Aren’t tea things pretty? All those little cups and tea pots are so nice. It would be lovely to go regularly just to try them all out. It is lovely and we enjoy it. The sad thing is sometimes we get busy and forget about it. But always fun to remember and return. I do love tea and the accessories are beautiful. Thanks for reading and commenting.